How do you jerky? Are you a beef, bacon, elk, buffalo or venison (deer) meat lover? Smokehouse Jerky Company has it all! Personally, I like a good beef or venison jerky. 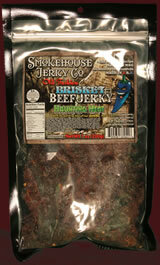 Smokehouse Jerky Company has so many flavors anyone can find their perfect jerky. They have flavors your more mainstream flavors like original, cracked pepper and teriyaki and then they have their bolder flavors like Tropical Fusion (mix of pineapple and mango), Smoky BBQ, Sea Salt and Honey Pepper, Spicy Sweet, Oh That's Hot, Haunting Heat and Peppered Orange Teriyaki in their beef varieties. In their bacon varieties they really shine in my opinion with their Applewood Smoky Style and Sriracha Cha Cha. Their elk, buffalo and venison come in different varieties as well including Original, Sweet Peppered and Sweet and Hot. I love making recipes and can appreciate the difficulty it takes to make a successful, great tasting jerky. I myself dabble in beef and venison jerky and it has taken me years to come up with a recipe that is even really edible. I was amazed at how Smokehouse Jerky Company has mastered jerky making. Their taste for seasoning and pairing the perfect spices and flavors is spectacular. All of their jerkys have no added MSG, are made in the USA and the beef varieties are cut from premium beef brisket. They not only have the meat down to a science they have the flavor to go with it. With mouthwatering varieties that even my kids enjoyed! I liked the Sea Salt and Honey Pepper. It had that burst of hot with the follow up flavor of the honey and the topping off of the Sea Salt that mingles in your mouth creating that absolutely perfect taste. My husband loves hot he was in jerky heaven! He really enjoyed the Haunting Heat. My sons really enjoyed the Original, Smoky BBQ and the Teriyaki varieties. The Bacon Beef Jerky was really different. I think it is one of their best products. I loved the Applewood Smoky Style. It has a real strong smoky, bold flavor and the bacon jerky's really well. Jerky is really the perfect gift for all occasions! Make sure yo stop by Smokehouse Jerky Company's website here and purchase some of their amazing varieties. Their jerky would be perfect for Easter Basket stuffers or even Mother's Day Gifts! Who doesn't love getting food? 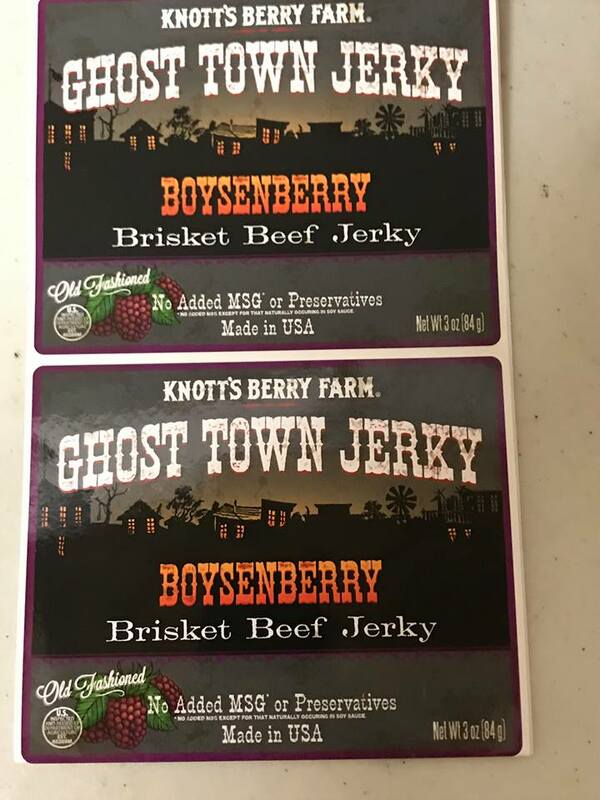 Smokehouse Jerky Company is also the official jerky of Knott's Berry Farms now. They just came out with their newest variety Boysenberry! You have to be a superior jerky company to get the distinction of becoming Knott's Berry Farms official jerky. This flavor they came up with I can not wait to try! Make sure to purchase from Smokehouse Beef Jerky and follow them on social media below. You will not be disappointed! Smokehouse Jerky wants to give some lucky fans a chance to win their own jerky just enter below! 5 winners will each receive 2 bags each of their choice. 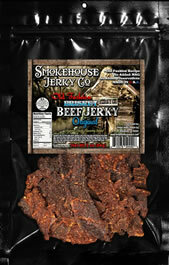 Winners are required to post a site review of the 2 products they win to Smokehouse Jerky's site! The spicy sweet and smoky bbq are the two I am most interested in. I like the sound the the "hot" varieties, but in my experience, too much heat takes away from the taste of jerky. I would gladly leave a review of their product. Ole Cracked Pepper and haunting Heat sound really good. I received my jerky right before I went on vacation. Perfect timing! The jerky made for a nice snack when I was out all day. It was lightweight and easy to pack. The jerky itself was tender without bits of gristle. I tried the boysenberry flavor and the black pepper. The boysenberry was incredibly sweet and had a sheen of crystallized sugar. I liked the flavor, but the sweetness made it hard to eat too much of it at one time. The black pepper tasted more like a teriyaki-ish flavor. The tamari lent a salty flavor to the jerky - to the exclusion of any other flavors. It wasn't bad, but probably not a flavor that I'd choose again.